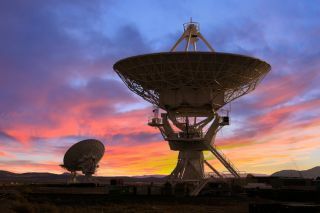 The Very Large Array in New Mexico is searching for out-of-this-world signals from extraterrestrial intelligence. But it still only covers a vanishingly tiny slice of the search space where alien signals could hide. Editor's Note: This story was corrected at 5:20 p.m. E.D.T. Where are all the aliens? For decades, humans have searched for artificial signals, yet the skies above remain silent. But new research suggests that researchers' investigations have so far not been particularly exhaustive; if the total possible search space were equivalent to the all the water in Earth's oceans, we have examined only a hot tub's worth of volume. "It is often said that we have been looking for 40 years or so, but we still haven't found any signs of extraterrestrial civilization," said Shubham Kanodia, an astronomy graduate student at Penn State University and co-author of the new paper in the preprint journal arXiv, which has been submitted to The Astronomical Journal. "We wanted to see how much have we looked and how much more do we need to look." Researchers see radio telescopes as an obvious instrument to use for such investigations, because radio waves travel easily through interstellar dust and, in certain parts of the radio spectrum, background interference is minimized. "It is the 'cosmic quiet zone' where we can best listen for a faint whisper across the interstellar expanse," as an article on the SETI Institute's website puts it. The findings support those who argue that "the Great Silence" is merely an artifact of our limited investigations. "Bright and obvious radio beacons might be quite common in the sky, but we would not know it yet, because our search completeness to date is so low," the authors wrote in the paper. However, even if we searched both optical and radio wavelengths thoroughly, that would likely represent only a small sliver of the potential search space. In the course of their history, extraterrestrials might have come across many phenomena that humans have not, some of which might be useful for generating signals, Kanodia said. "In all probability, there is still a lot of physics that we have not yet deciphered or understood," he said. "If you were trying to communicate with a caveman with a walkie-talkie, you would not receive any reply." The results are heartening, said Jill Tarter, an astronomer and former director of the Center for SETI Research, who has done similar calculations in the past. Her results suggested that total SETI searches were akin to looking at a drinking glass's worth of seawater and concluding that there were no fish in the ocean. "I was glad to see that I was in the right ballpark," she said. "It's a very big ocean, and so far, we haven't been able to investigate very much of it." Editor's Note: This story was updated to note that the study looked at eight parameters, including how much of the sky a telescope searched, not the number of star systems searched.